Najdorf’s famous brilliancy against ‘Glucksberg’ (1 d4 f5 2 c4 Nf6 3 Nc3 e6 4 Nf3 d5 5 e3 c6 6 Bd3 Bd6 7 O-O O-O 8 Ne2 Nbd7 9 Ng5 Bxh2+ 10 Kh1 Ng4 11 f4 Qe8 12 g3 Qh5 13 Kg2 Bg1 14 Nxg1 Qh2+ 15 Kf3 e5 16 dxe5 Ndxe5+ 17 fxe5 Nxe5+ 18 Kf4 Ng6+ 19 Kf3 f4 20 exf4 Bg4+ 21 Kxg4 Ne5+ 22 fxe5 h5 mate) was discussed in C.N.s 1377, 2013 and 2052 (see page 306 of Kings, Commoners and Knaves). Contrary to frequent claims, it was not played in 1935. Jan Kalendovský reported in C.N. 2013 that the score had been published, with brief notes by Najdorf, in Právo lidu on 1 November 1930, the Czech publication’s source being given as Kurjer Warszawski. Then C.N. 2052 mentioned the discovery by the Polish chess historian Tadeusz Wolsza that the game had been published in the newspaper Dzień Polski in August 1930. 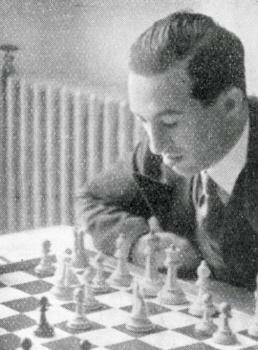 Moreover, Mr Wolsza established that both Najdorf and Glucksberg had participated in a ten-player tournament in Warsaw which ended in January 1930 and that Najdorf had won their individual game. ‘C.N. 1377 (Kings, Commoners and Knaves, page 306) dealt with some queries from a Spanish reader of the magazine Jaque in 1986. 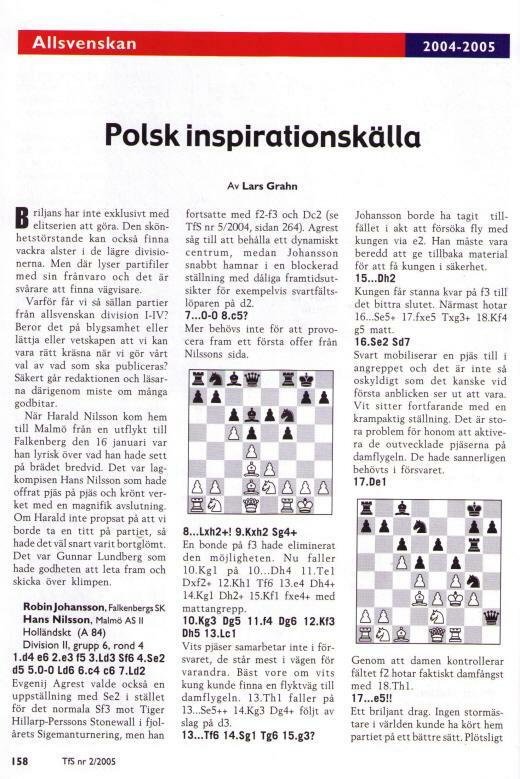 At one point, he remarked that Najdorf had learned chess at the age of 16 yet had claimed (in an article published in the January 1975 issue of Jaque) to have played the “Polish Immortal” one year later, in “un campeonato de Polonia” (no date or place specified by Najdorf). 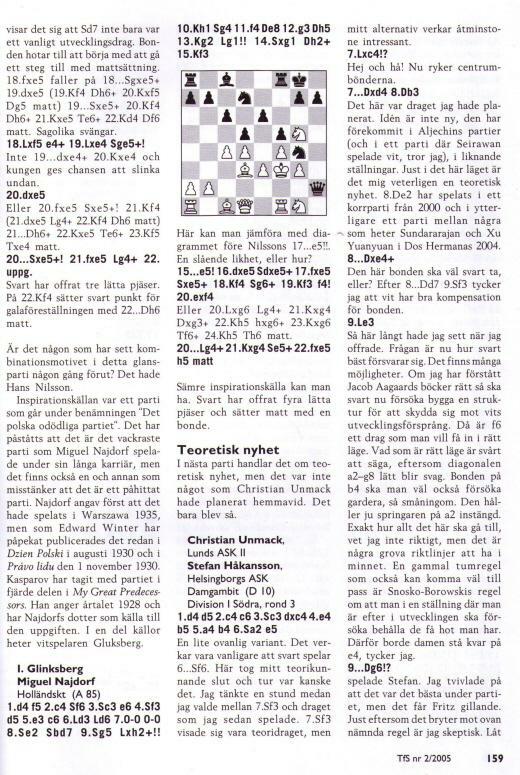 According to page 31 of Liliana Najdorf’s biography Najdorf x Najdorf he learned chess at the age of 14, which would have given him more time to make progress and play a high-quality game at 17.
and your Spanish correspondent added that he had been awaiting that other game for over ten years. It remains to be seen whether further investigation of the Najdorf v Szapiro game will supply clues about the ‘Polish Immortal’ or whether Najdorf was wrong to state that the two games were played in the same tournament. We add that although Miguel Najdorf El hijo de Caissa used the spelling ‘Shapiro’ it would seem that he was the player featured on pages 120-122 of volume four of Arcymistrzowie, mistrzowie, amatorzy by T. Wolsza (Warsaw, 2003), i.e. ‘Salomon Szapiro (1882-1944?)’. That book listed him as having participated in tournaments in Łódź in 1928 and 1930, but in no events in Warsaw at any time in his life. Not for the first time with this topic, we feel that we are floundering. On this topic our thanks are also expressed to Calle Erlandsson (Lund, Sweden) and Tomasz Lissowski (Warsaw). It will be noted that Najdorf’s opponent is named as Gliksberg. The game, it is stated in the heading, was played in Warsaw earlier in the year. ‘Confusion still reigns regarding the Polish Immortal. The Kurjer Warszawski of 19 October 1930 (C.N. 6388) named the player of the white pieces as Gliksberg. However, Najdorf himself chose to correct only the date (commonly given as 1935, but corrected by Najdorf to 1930) in his commentary on the game on pages 62-63 of Najdorf: Life and Games by Tomasz Lissowski and Adrian Mikhalchishin (London, 2005). He left White’s name as Glücksberg. See too Najdorf against the French Defence. Latest update: 30 December 2012.